Your fire alarm system is your first response for alerting the people in your building to a fire or emergency. Therefore, keeping your system in proper working order is crucial for keeping your employees safe at all times! At State Systems, Inc., we can design and install a fire alarm system that will work with your Lakeland area facility and keep everyone protected. We also offer inspecting, testing, and repair services on all fire alarm systems in Lakeland, TN. To schedule service or request an estimate, call us today at 866-308-5701! At State Systems, Inc., we offer fire alarm design/build solutions with total integration capability to best meet your Lakeland area building’s needs. We provide project managers and computer-aided drawing (CAD) technicians for all your fire alarm installations. By offering Edwards Systems Technology/EST fire alarm panels and components, your organization will benefit from top-of-the-line products and professional service from State Systems, Inc.
We have long been known throughout Tennessee for fire protection services and technologies. Utilizing our strategic partnership with Edwards/EST, we are able to offer a superior line of fire alarm system solutions for our customers in the Lakeland area. To request an estimate for a fire alarm system for your Lakeland building, contact us online. If you already have a fire alarm system installed in your building, you still need regular testing and inspection of the system to ensure that it is ready to operate and alert your employees and customers of an emergency. We offer control panels in all shapes and sizes for your specific application. Whether you need a simple conventional panel or a more complex addressable panel, our certified technicians will customize our line of fire alarm panels to fit your needs. 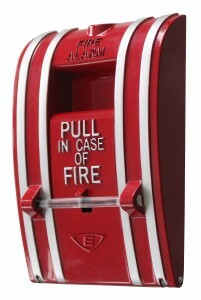 We also offer a variety of fire alarm devices, including detectors and sensors, for every application. Many of our devices have microprocessor-based intelligence, being able to navigate differing sensor states and adjust for environmental changes. These highly visible (and probably the most easily recognizable) parts of a fire alarm system come with different styles and features for your selection. Our fire alarm technicians can utilize microprocessor capability in these devices as well—allowing for self-diagnostics and stand-alone processing. State Systems, Inc. ensures that these devices fit the mold of your facility, with differing colors, placements, and functionalities to complement your building’s design. Proper code compliance and utmost concern for occupant safety are always our top concerns. If you need fire alarm inspection, testing, or repair service for your building in Lakeland, TN, call State Systems, Inc. today or click here to contact us!